A woman's life is full of confusing menopausal words and phrases that all have their own unique definitions and refer to different stages of her reproductive life. Early menopause and premenopause can often get mixed up with one another because they sound so similar. However, they have distinct definitions, with premenopause being something that all women experience and is a normal and natural part of a woman's reproductive life, and early menopause being something that is relatively rare. Keep reading for more information about these stages of menopause and the differences between them. For some women, however, the menopausal transition can come much earlier than expected. She might experience menopausal symptoms and cease menstruating when she is in her 20s or 30s. It's estimated that one in a hundred women go through menopause when they're under 40, and one in 10 of these are under 30. This can be a very distressing condition, and can also have some unhealthy side effects; for example osteoporosis, owing to the reduced estrogen levels. The causes of early menopause are normally certain illnesses, lifestyle factors (such as smoking), or genes. It is the main portion of a woman's life and encompasses most of her reproductive years. It begins at around the age of 13, when a girl gets her first period, and finishes when the woman begins to see the first signs of perimenopause, normally in her 40s or 50s. During this time, a woman will experience regular monthly periods and can have children. Due to the hormonal fluctuations of the menstrual cycle, many women find that they experience premenopause symptoms around the time of their period each month. This is more commonly known as premenstrual syndrome (PMS), and symptoms can vary in intensity depending on each woman. A few examples of possible symptoms are irritability, mood swings, cramps, bloating, and breast tenderness. Perimenopause, which can last from 2 - 10 years. 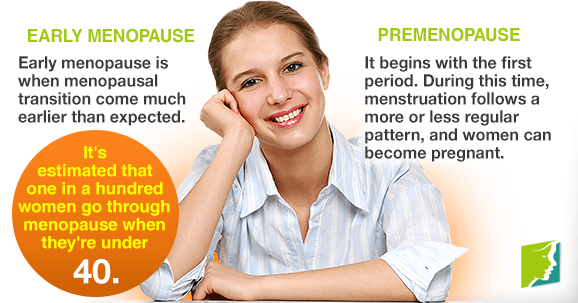 This is defined as the time from when a woman begins to experience menopausal symptoms until she has not had a period for a year. When this has occurred, it is said the woman has reached menopause, and she then transitions into the postmenopause stage, where she will be for the rest of her life.From the above definitions, it should now be clear what the differences are between early menopause and premenopause. Both come with their own symptoms and side effects, but these can be managed. If you are experiencing any discomfort, then it is important to talk to a doctor, who can help you manage them. Some women will find weight management throughout premenopause more difficult than others. Discover some tips on weight management during premenopause.